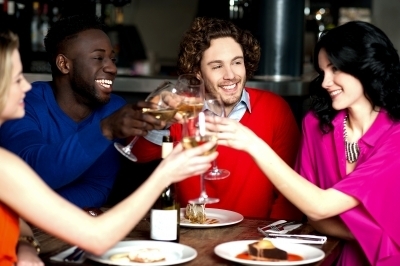 Host a dinner party rather than meeting your mates down the pub or at a fancy restaurant. You can still split costs by asking guests to bring a dish and having wine and beer at home definitely cuts down the inflated cost of a big night out. One of the best things about this option is that the night doesn't have to end at pub closing time, and hosting a home presents a more intimate gathering which makes for great conversation. Have a wine tasting evening in your house. Ask every guest to bring a bottle of wine they've never tried before and just wrap each bottle in a piece of paper so that you can do blind tastings. For an added bit of fun, you could download this FREE wine tasting notes sheet to make the evening even more sophisticated. If you're not an alcohol drinker, then use your imagination and consider cheese tasting evenings, or one of my favourites would be a chocolate tasting evening. It's generally cheaper to rent a movie than it is to go to the cinema, so set yourselves up for a budget friendly movie night with home made popcorn, candy and the film of your choice. Start a fitness club with your friends. If you're getting sick of paying $15 a time for your fitness club down the gym but really enjoy the social benefits of group exercise then create your own running or walking club. Another option could be to get a few of your closest friends together and do a fitness DVD at home. At weekends, get out and enjoy the great outdoors. There are tonnes of free activities just ready for the taking and if you're in the mood to be social, invite your friends and family along. Great ideas include picnics, walks in the countryside, beach outings, cycling even a camping weekend with friends. All of these free activities will keep you from spending too much money in bars and restaurants. Saving doesn't mean the end of your social life, it just means that you need to look at different ways to have fun.